$3.00 is the suggested donation for use of this idea. Become a Support Partner today! Click here! 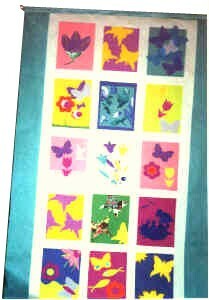 Making a paper quilt is easy enough for children, yet adults will enjoy making it too! The women of our church made the one seen here during our weekly Bible study. Later in the season we displayed it for our Women's Tea to represent our theme, "New Life in Christ." What you need: white butcher paper, various bright colors of 8.5" x 11" paper, templates or patterns of New Life designs, (i.e. butterflies, flowers, fish, or various other Christian symbols), glue sticks, scissors, banner paper wider than the butcher paper, wooden dowels wider than the banner paper, heavy duty staple gun, cord for hanging. What you do: Give each person a choice of colored papers and templates and patterns to cut out Christian or New Life shapes. Arrange the shapes on the colored paper and glue them on. Allow everyone to create their own design. (Try cutting New Life shapes using photos from magazines or newspapers too.) Glue the individual works of art onto the butcher paper. Glue or staple the butcher paper onto the banner paper. Wrap the ends of the banner paper around the dowel. Staple shut. Tie the cord to both ends of the dowel. Hang and display your beautiful Paper Quilt! Tell your friends about this idea. Invite them to visit SundaySchoolNetwork.com.